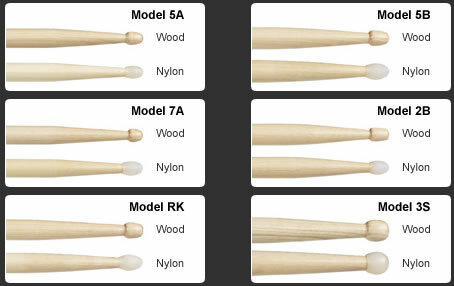 Wood type and moisture content are key elements in a drumstick's response and durability. Too much moisture produces a stick that feels weak and warps quickly. Too little moisture will produce a stick that is very brittle and breaks easily. Achieving the proper balance of moisture produces a stick that is very durable and stays straight. Wood with a low moisture content is often used to make inexpensive sticks but while this will increase the number of straight sticks in a production run, it also significantly decreases stick quality and durability. American hickory is the optimum material in terms of durability, weight, balance, consistency, response and feel. The most preferred hickory for drumsticks comes from Kentucky, Tennessee, and the Southeastern United States. It is dense and durable yet can also absorb a great amount of energy, which reduces hand and wrist fatigue. Traditional “A”, “B” and “S” designations are somewhat outdated and inconsistent but often useful in choosing a general type of stick to meet the needs of a given style or situation. The length and diameter of the body are the main factors in determining the quantity of sound as well as the player’s comfort/control of the stick. Note: Larger sticks are more powerful and durable but are often less comfortable, harder to control and may lead to muscle fatigue. *The shoulder and body also affect the weight and balance of the stick. The thickness of the neck and length of the taper determine strength and sensitivity. The size and shape of the tip determine the quality of sound.